For other uses, see Space Adventures (comics) and Space Adventures – Music from 'Doctor Who' 1963–1968. Space Adventures, Inc. is an American space tourism company founded in 1998 by Eric C. Anderson. As of 2010[update], offerings include zero-gravity atmospheric flights, orbital spaceflights (with the option to participate in a spacewalk), and other spaceflight-related experiences including cosmonaut training, spacewalk training, and launch tours. Plans announced thus far include sub-orbital and lunar spaceflights. As of October 2009[update], seven clients have participated in the orbital spaceflight program with Space Adventures, including one person who took two separate trips to space. Eric C. Anderson is the president and CEO of Space Adventures. He co-founded the company in 1998 with several other entrepreneurs from the aerospace, adventure travel and entertainment industries. The company is headquartered in Tysons Corner, Virginia with an office in Moscow. Space Adventures offers a variety of programs such as Orbital spaceflight missions to the International Space Station, Circumlunar missions around the Moon, zero gravity flights, cosmonaut training programs, spaceflight qualification programs, and reservations on future suborbital spacecraft. Since 2001, Space Adventures has launched seven clients on eight successful missions to the International Space Station (ISS). In April 2001, the company sent American businessman Dennis Tito for a reported $20 million payment, making him the first space tourist. 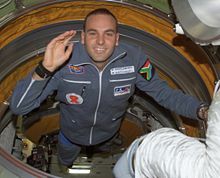 South African businessman Mark Shuttleworth did the same in April 2002, becoming the first African in space. Gregory Olsen became the third private citizen to travel to the ISS in October 2005, followed by the first female space tourist, Anousheh Ansari, who completed her 10-day orbital mission in September 2006. Charles Simonyi, an ex-executive at Microsoft, became the fifth space tourist who visited the ISS in April 2007, then again in March 2009. He is the world’s first private space explorer who launched to space twice. In 2008, game developer Richard Garriott, the first second-generation U.S. astronaut, became the sixth client to travel to the ISS. In October 2009, Cirque du Soleil founder, Guy Laliberté, became the first Canadian space tourist to have launched to space. English soprano Sarah Brightman was expected to become the eight client of Space Adventures to visit the International Space Station, paying $52 million for her flight. However, the company announced in May 2015 that Brightman had postponed her trip "for personal family reasons." Originally, Brightman was expected to be replaced by another Space Adventures client, Japanese advertisement entrepreneur Satoshi Takamatsu; however, in June 2015, the company announced that Takamatsu had elected to postpone his flight in order to prepare for "art projects that [he] would like to perform in space require cutting-edge technology both in hardware and software." The spot was eventually taken by Kazakh government cosmonaut Aidyn Aimbetov. In January 2008, Space Adventures acquired Zero Gravity Corporation which is the first and only FAA-approved provider of weightless flights to the general public. The company's advisory board includes Apollo 11 moonwalker Buzz Aldrin, Space Shuttle astronauts Sam Durrance, Tom Jones, Byron Lichtenberg, Norm Thagard, Kathy Thornton, Pierre Thuot, and Charles Walker, Skylab/Shuttle astronaut Owen Garriott, and Russian cosmonaut Yuri Usachev. Space Adventures’ first orbital spaceflight client and the world’s first private space explorer launched to the ISS in April 2001 on Soyuz TM-32. American businessman Dennis Tito received training at the Yuri Gagarin Cosmonaut Training Center in Star City in Russia. Tito participated in Space Adventures’ other programs, including a zero-gravity flight, centrifuge training and a supersonic jet flight prior to his orbital flight. Mark Shuttleworth spent 10 days in space. He launched with two crewmates, Russian commander Yuri Gidzenko and Italian astronaut Roberto Vittori. They launched on Soyuz rocket TM-34 from the Baikonur Cosmodrome, Kazakhstan on April 25, 2002. Prior to his flight, Mr. Shuttleworth completed Space Adventures’ Orbital Pre-Qualification Program and underwent almost eight months of training and medical exams, including a one-week orientation program at NASA’s Johnson Space Center in Houston. A zero-gravity flight, centrifuge training, and spacecraft communication, guidance and control system lessons of the Russian Soyuz spacecraft and ISS were also part of his training. Shuttleworth dedicated his flight to educating South African youth and conducting scientific research. Dr. Gregory Olsen completed over 900 hours of training in Star City, Russia in preparation for his mission. He and his crew mates launched from the Baikonur Cosmodrome on October 1, 2005 aboard Soyuz TMA-7. While aboard the ISS, he participated in a research program prepared by the European Space Agency that studied the human body’s response to the microgravity environment. Through Amateur Radio on the ISS, Dr. Olsen contacted high school students in New Jersey and New York. Anousheh Ansari lifted off on Soyuz TMA-9 on September 18, 2006 from Baikonur, Kazakhstan. Ansari became the fourth (and first female) space tourist. During her eight-day stay on board the International Space Station, Ansari conducted four experiments for the European Space Agency, including researching the mechanisms behind anemia, how changes in muscles influence lower back pain, consequences of space radiation on ISS crew members and different species of microbes that have made a home for themselves on the space station. Dr. Charles Simonyi is the first repeat orbital spaceflight client of Space Adventures'. His first spaceflight mission was in 2007 aboard Soyuz TMA-10 and his second was in 2009 aboard Soyuz TMA-14. Simonyi's goals for both of his missions were to advance civilian spaceflight, assist space station research and involve the world’s youth in the science of space travel. His website, www.charlesinspace.com, had 33 million viewers. Richard Garriott became the first American and second overall second-generation space traveler on following his astronaut father Owen Garriott into space in 2008. He is also the second person to wear the British flag in space. He launched for the International Space Station on October 12, 2008 aboard Soyuz TMA-13. Richard's main objective for his mission was to encourage commercial participation. By fostering the involvement of individuals, companies and organizations in his spaceflight, Richard hoped to demonstrate that there is commercial potential in private space exploration, while furthering the understanding of space. One of his crewmates on his return journey to Earth aboard Soyuz TMA-12 was Sergey Volkov, the first second-generation space traveler, who followed his father, cosmonaut Aleksandr Volkov into space. Guy Laliberté is the first Canadian space tourist who reached orbit on September 30, 2009 aboard Soyuz TMA-16. While in orbit, Laliberté promoted the One Drop Foundation and proclaimed his mission as a “Poetic Social Mission”. He also conducted the first ever artistic and social event, “Moving Stars and Earth for Water,” to originate from space that took place on October 9, 2009. It was a two-hour event that was hosted by Laliberté and many celebrities such as Salma Hayek, Shakira and Bono, who participated from Earth. He returned to Earth on board Soyuz TMA-14. This program allows individuals to reserve seats on future orbital spaceflights. They have the option to fly to orbit as their schedule allows with preferential access to mission seats or they can opt to sell their seat to another private astronaut. Sergey Brin, co-founder and president of technology for Google Inc., has become the founding member of the "Founding Explorer" group by placing a $5 million deposit on a future orbital spaceflight. Space Adventures has established the Orbital Mission Explorers Circle to build a definitive consortium of future private space explorers who share a lifetime goal of orbital spaceflight or the investment therein. Space Adventures has initially created six "Founding Explorer" positions in the Orbital Mission Explorers Circle, each of whom will have priority access to participate in future orbital space missions. In 2006, the company announced that it would begin offering a spacewalk option to its clients traveling to the ISS. The spacewalk would allow participants to spend up to 1.5 hours outside the space station and costs about $15 million. It would lengthen the orbital mission approximately six to eight days. The spacewalk would be completed in the Russian designed Orlan space suit. The training for the spacewalk would require an extra month of training on top of the six months already required. Space Adventures is offering advance booking for a future lunar mission involving travel to circumnavigate the Moon, on a circumlunar trajectory. Pricing was announced at US$100 million per seat, as of 2007[update]. This mission will utilize two Russian launch vehicles. One Soyuz capsule will be launched into low Earth orbit by a Soyuz rocket. Once in orbit, the crewed capsule will dock with a second, uncrewed, lunar-propulsion module which will then power the circumlunar portion of the trip. The mission will last 8–9 days. That includes (approximately) 2½ days in Earth orbit, docking with the propulsion stage, 5 days to reach lunar orbit, a 45-minute observation of the Moon from as low as 100 km, and 2½ days to return to Earth. In 2011, Space Adventures announced that they had sold one of the seats on the lunar voyage for $150 million, and are in negotiations for selling a second seat. They wouldn't reveal the name of the person to whom the ticket was sold but claim he or she is well known. By 2014, they claimed to have found two people willing to spend $150 million and it could happen within three years. Space Adventures have subsequently amended their website to say they expect the first circumlunar voyage will occur before the end of the decade. The company, along with Prodea[clarification needed] and the Federal Space Agency of Russia, began in the mid-2000s to develop a suborbital space transportation system, called Explorer. The vehicle was to be designed by Myasishchev Design Bureau, a Russian aerospace organization which had developed other aircraft and space systems. Space Adventures abandoned the Explorer project in 2010 because "it got too expensive." In 2010, Armadillo Aerospace was working on a sub-orbital commercial rocket that was to have been marketed through Space Adventures. The per-passenger price point was announced in April 2010 to be $102,000 for a flight to 62 miles' altitude, above the Karman line. The Armadillo-developed technology was to have been a vertical takeoff, vertical landing (VTVL) suborbital vehicle carrying space tourists to at least 100 kilometers' altitude, with Space Adventures selling the seats. The spacecraft development effort was jointly funded by both Armadillo and Space Adventures. The project has gone quiescent, as the assets of Armadillo Aerospace were sold to Exos Aerospace in May 2014. Japanese businessman Daisuke Enomoto sued Space Adventures as his trip was canceled by them for medical reasons after he paid $21,000,000 and no refund was given. ^ "Space Adventures, Ltd. - Home". Space Adventures. Retrieved 28 December 2014. ^ "Singer Sarah Brightman calls off tourist flight to International Space Station". The Guardian. 13 May 2015. ^ a b "SPACE ADVENTURES ANNOUNCES CONTRACT WITH SATOSHI TAKAMATSU FOR A FUTURE ORBITAL SPACEFLIGHT MISSION". Space Adventures. 22 June 2015. ^ Kim Hart (2007-04-21). "Travel agency launches tourists on out-of-this-world adventures". Seattle Times. Retrieved 2008-05-26. ^ "Shuttleworth Launched to International Space Station". April 25, 2002. Archived from the original on March 18, 2012. Retrieved 2012-01-16. ^ "Space Adventures' Client, Greg Olsen, Returns to Earth After Visiting the International Space Station". Comspacewatch.com. Archived from the original on 28 December 2014. Retrieved 28 December 2014. ^ "The mission of the Soyuz TMA-9 (No. 219) spacecraft (the ISS mission 13S) in the fall of 2006 had a goal of delivering and returning the 14th long-duration crew to the International Space Station. The launch was scheduled for September 14, 2006". Russianspaceweb.com. Retrieved 28 December 2014. ^ "Performers Celebrate Water from Earth and Space". Space.com. 9 October 2009. Retrieved 22 September 2015. ^ "SARAH BRIGHTMAN POSTPONES SPACEFLIGHT PLANS". Space Adventures. 13 May 2015. ^ Marre, Oliver (2009-03-15). "Master of the online universe". The Guardian. London. ^ Tariq Malik (2006-06-21). "Space Adventures Offers $15 Million Spacewalks for ISS Visitors". Space.com. Retrieved 2008-05-26. ^ Belfiore, Michael (2007). Rocketeers: how a visionary band of business leaders, engineers, and pilots is boldly privatizing space. New York: Smithsonian Books. p. 11. ISBN 978-0-06-114903-0. the ... Russian space program cut a deal with Florida-based Space Adventures to send two tourists and a professional cosmonaut on a flyby mission around the Moon. The major hardware for the mission already exists; all that's needed now is to find two people willing and able to pony up $100 million each to pay for it. ^ a b c Lunar Mission, SpaceAdventures website, undated, accessed 2010-05-24. ^ "Just One ($150 Million) Seat Remains on Space Adventures' Lunar Flyby". 26 April 2011. Retrieved 15 October 2016. ^ "Russia to Fly Two Tourists Around the Moon by 2017". June 3, 2014. Retrieved 15 October 2016. ^ Alan Boyle (2006-02-17). "New group to develop passenger spaceship". MSNBC. Retrieved 2008-05-26. ^ a b Space Adventures returns to suborbital spaceflight, NewSpace Journal, 2010-05-28, accessed 2010-05-28. ^ Perhaps You'll Visit Space In Your Lifetime, After All, Gizmodo, 2010-05-12, accessed 2010-05-15. ^ "'Japanese businessman defrauded of $21 million by the U.S. space tourism company'". Japan Probe. 2008-09-26. Archived from the original on 2008-09-27. Retrieved 2008-09-28.